The square antiprism is a 3D uniform polyhedron bounded by 2 squares and 8 triangles. 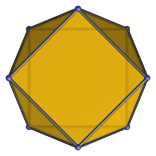 It has 16 edges and 8 vertices. The height of a square antiprism with an edge length of 2 is 23/4, or approximately 1.68179. A square antiprism can be capped with a square pyramid to form the gyroelongated square pyramid (J10), a Johnson solid, or with two square pyramids to form the gyroelongated square bipyramid (J17), another Johnson solid. Parallel projection centered on square face. Parallel projection parallel to square faces and a pair of triangles. Parallel projection centered on an edge between two triangles. Last updated 09 Mar 2018.